Skiing. Snowshoeing. Snowboarding. Winter activities are a dime a dozen but when you think of fun, shovelling does not come to mind! 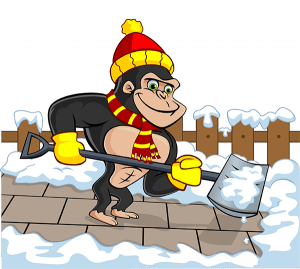 Instead of letting snow maintenance cut into your leisure time, let our Gorillas do the work for you. Our expert technicians are ready to perform your Surrey snow removal and salting at any time of day or night. In Canada, snow is a fact of life but on the west coast, you never know what you are going to get! One day might be sunshine with green grass while the next is a full-blown snowfall. Snow management is not something that crosses the mind of most British Colombians on a day to day basis but when it hits – you can’t ignore it! Eliminating snow piling and ice patches can mean hours of hard labour, shovelling snow or hauling tonnes of salt. Depending on the size of your property, snow shovels might not be enough to get the job done. Areas such as parking lots, storefronts or long term care facilities are not always ready for the amount of snow that sneaks up on them. Since the majority of residents do not have snow plows or blowers just sitting around, these are the times to call in reinforcements. Purchasing and maintaining power tools can be expensive, but our Gorillas are equipped with the right tools to handle any space. Every year, hundreds of Canadians are admitted to hospital over slips and falls associated with icy sidewalks and roads. Having regular salting services can prevent these icy conditions and make sure that you stay in one piece through those winter months! Because there is no way to predict what condition your property is going to be in – residents are often caught off-guard. With our Gorillas in your corner, you don’t have to worry about hunting down bags of salt or trying out make-shift solutions. It is impossible for successful snow removal operations to run on a 9-5 schedule. Instead of allowing residents to become buried under heavy snow fall, our Gorillas and plow operators offer emergency services 24 hours a day.